The Westminster Kennel Club Best in Show went to Flynn the Bichon Frisé but each breed represented at the WKC Dog Show is special in its own right. Let’s learn a bit more about the breeds behind the seven Westminster Kennel Club finalists right here. Bean the Sussex Spaniel. Photography by Kayla Bertagnolli. ‘Bean’ the Sussex Spaniel is truly well named as he is always full of beans and puts on an entertaining performance for judges and ringside spectators alike. 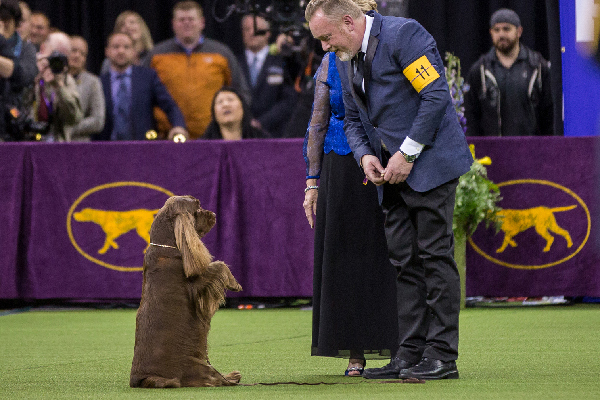 More formally known as Grand Champion Kamands Full of Beans @ Erinhill, this multiple Best-in-Show winner is handled by Per Rismyhr, a spaniel specialist, for his proud breeders and owners, Karen Ann Toner and Amanda Toner. Sussex Spaniels are a long and low breed that love to sit on their haunches and beg at every opportunity. Needless to say, the roaring crowds at Madison Square Garden fell in love with this routine and only egged on Bean the ham to sit up and beg every time Rismyhr walked him up to the judge, Elizabeth “Beth” Sweigart. Judge Sweigart got her start in Labradors, so she is an expert on all the Sporting breeds and recognized what a superb specimen Bean is. He was in sparkling condition and well-muscled with his golden-liver coat, a hallmark of the breed, glistening. The breed’s long, low body with heavy bone was developed to hunt in heavy brush and undergrowth. Although the Sussex Spaniel was one of the original nine breeds to be recognized by the American Kennel Club, the breed never gained popularity, as hunters preferred the faster, flashier gun dogs. Today, the Sussex Spaniel is one of the rarest breeds in the world. 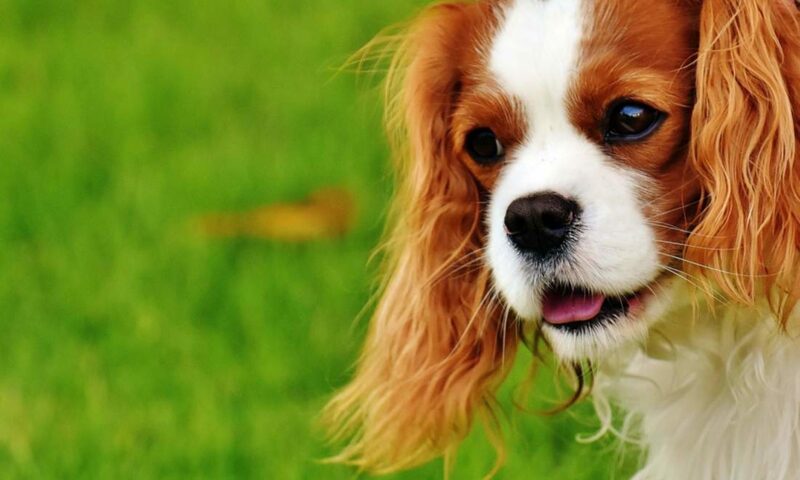 Many Americans first became acquainted with the breed in 2009 when ‘Stump’ made history by becoming the first Sussex Spaniel, and the oldest dog of any breed at age 10, to win Best in Show at Westminster. Lucy the Borzoi. Photography by Kayla Bertagnolli. 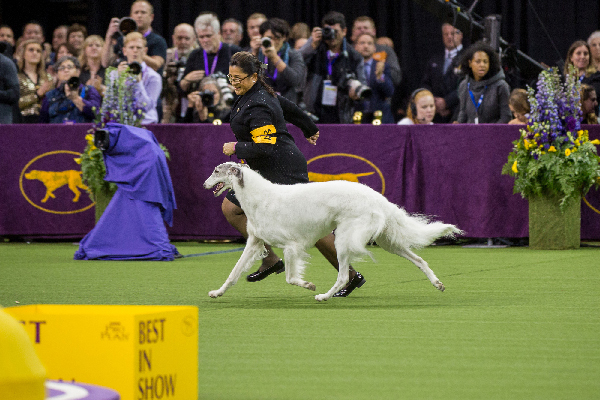 ‘Lucy’ the Borzoi triumphed in the Hound Group, repeating her victory of 2016. Grand Champion Belisarius JP My Sassy Girl was born in Japan and went on to become that country’s top-winning dog of all breeds before she was sent to the USA to compete in dog shows here. She ended 2017 as the No. 1 Hound in America. She made an elegant picture, sweeping around the Westminster ring with her handler, Valerie Nunes Atkinson. With this win, she retired from the show ring and will return to Japan to begin the next chapter of her career, motherhood. The Borzoi was favored by the Russian aristocracy who went on wolf hunts with 100 or more of the fleet-footed hounds. Borzoi are classified as sighthounds, using their excellent eyesight to spot game. At home, they are quiet and dignified, making a loving companion for those who can provide them with the space to gallop freely in a safely enclosed area. Ty the Giant Schnauzer. Photography by Kayla Bertagnolli. ‘Ty’ the Giant Schnauzer who was the No. 1 dog all breeds for 2017, continued his winning ways at Westminster, claiming a Group First and ultimately Reserve Best in Show over nearly 2,900 dogs. Grand Champion Ingebar’s Tynan Dances With Wildflowers showed flawlessly for his handler, Katie Bernardin. Ty and Katie have competed in shows nationwide and never let down. In fact, Ty is the top-winning male Giant Schnauzer in breed history. 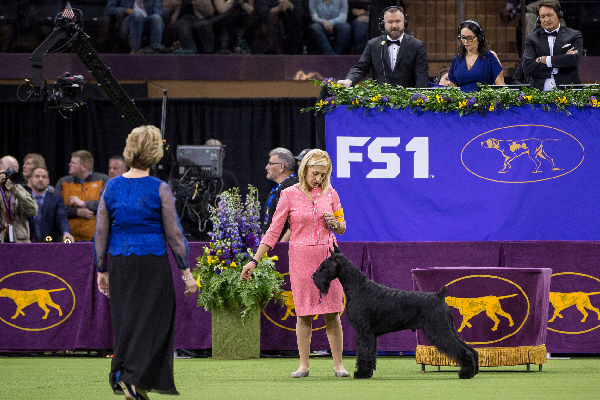 Interestingly, Ty’s talented breeder, the late Maryann Bisceglia, also bred the top-winning female Giant Schnauzer, and top Giant Schnauzer overall, in breed history. She passed away two years ago and is greatly missed in the dog show world. The Giant Schnauzer hails from Germany and is the largest of the three distinct Schnauzer breeds. The Giant Schnauzer was developed as a versatile protection, security and guard dog and has a loyal following in this country. Winston the Norfolk Terrier. Photography by Kayla Bertagnolli. 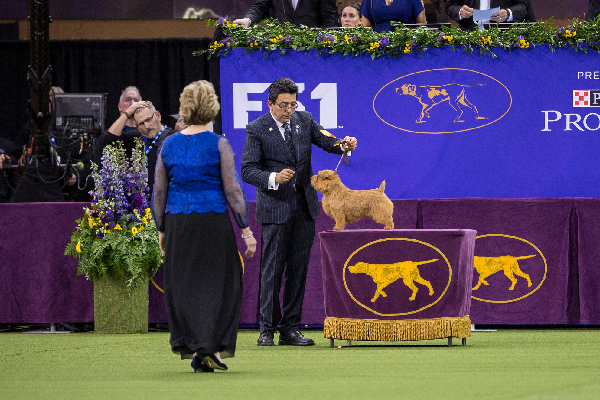 ‘Winston’ the irrepressible Norfolk Terrier caught the eye of Terrier connoisseur judge Rosalind Kramer and won the Group, handled by Ernesto Lara, who has also devoted his life to the Terrier breeds. Grand Champion Yarrow Venerie Winning Ticket is another great show dog that seems well named, since he is a multiple Best in Show and specialty winner enjoying enormous success. The American Kennel Club recognized the Norwich Terrier (drop and prick ear) in 1936. It took until January of 1979 for the Norwich Terrier, with its prick (or upright) ears, and the Norfolk Terrier, with its drop ears, to be given separate breed status. Game and hardy, compact and active, the Norfolk is one of the smallest of the working terriers. Biggie the Pug. Photography by Kayla Bertagnolli. When ‘Biggie’ the Pug was pointed to the No. 1 spot in the Toy Group by judge David Kirkland, it was a particularly emotional moment for his owner Carolyn Koch and his handler Esteban Farias. Biggie’s cousin ‘Rumble’ was top Pug and one of the biggest-winning Toy dogs in the country when he died suddenly last year. 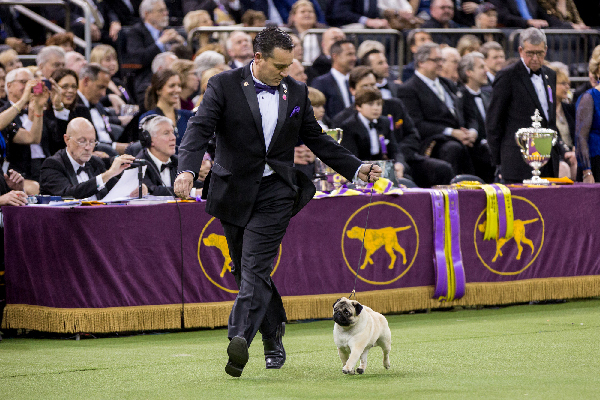 Biggie showed his heart out on the green carpet of the Westminster ring and brought home glory to his family. Somehow, he knew it was the night to rumble. Grand Champion Hill Country’s Puttin’ On The Ritz delivered a great performance and was certainly a crowd favorite. The Pug is of Chinese origin and dates back to pre-Christian times. Pugs were highly prized by the emperors of China. Dutch traders brought Pugs from the East to Holland, and then on to England. Happy and robust, with a range of human facial expressions, the Pug enjoys huge popularity around the world. The breed was recognized by the American Kennel Club in 1885. Flynn the Bichon Frisé. Photography by Kayla Bertagnolli. 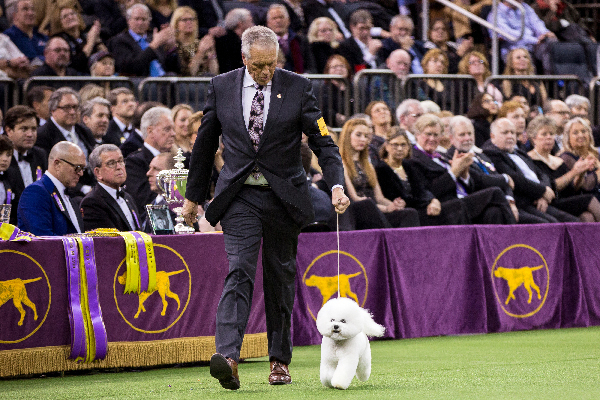 ‘Flynn’ the Bichon Frisé finished 2017 as the Top Non-Sporting dog in the nation and his momentum kept up through Westminster, where he led the pack. Grand Champion Belle Creek’s All I Care About Is Love was handled as always by the amiable Bill McFadden, and the animated powder puff was in top form. The Bichon Frisé breed originated in the Mediterranean regions and descended from the Barbet, a larger, curly-coated water dog. Italian and Spanish sailors took Bichons along on their voyages, both for company and as items of barter. In the 16th century, the breed appeared in France where it became a favorite of the aristocracy during the Renaissance. The Bichon Frisé arrived in the US in 1956. Slick the Border Collie. Photography by Kayla Bertagnolli. 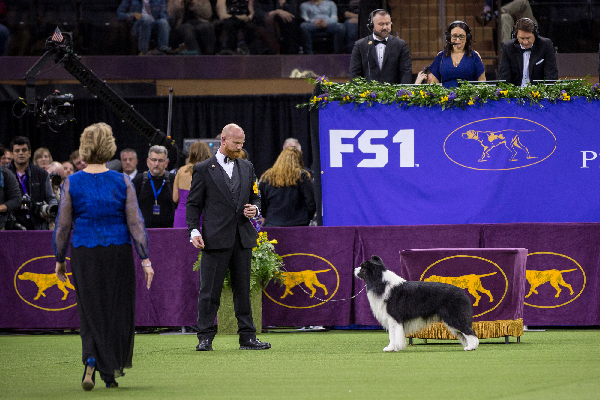 The Border Collie is known the world over as a versatile breed and ‘Slick’ proved it at Westminster, where he sailed into first place under judge Robert Vandiver. Grand Champion Majestic Elite Clever Endeavor, with many Best in Show wins to his credit, has become the top Border Collie of all time, shown by his equally athletic handler Jamie Clute. The Border Collie proved himself indispensable to shepherds by allowing them to maintain large flocks in the Border country between Scotland and England. Queen Victoria, a huge dog lover, became enamored with the breed in the 19th century and promoted it widely. The Border Collie is recognized worldwide as the quintessential sheepherding dog, admired for his obedience, trainability and natural appearance. 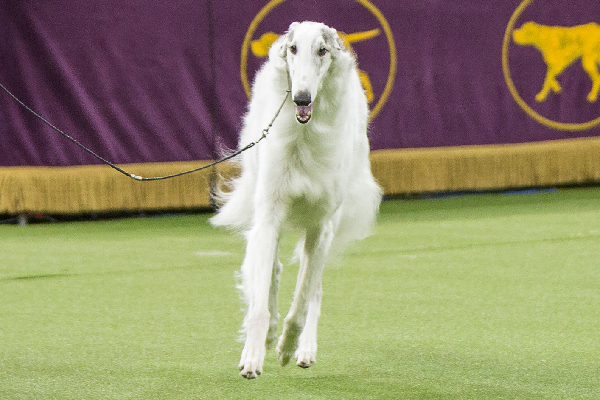 Thumbnail: Lucy the Borzoi. Photography by Kayla Bertagnolli. The post All About the Breeds Behind the Westminster Group Winners appeared first on Dogster.